Is Greenwood Right For You? Since 2008, The Greenwood School has had a rich, mutually-beneficial partnership with the Yellow Barn Music School and Festival, the nation’s preeminent nonprofit music program. Each school year, Greenwood students are exposed to the musical repertoire of the Yellow Barn artists through the Yellow Barn's on-campus, artist residencies and concerts. Greenwood students participate in Yellow Barn internships, attend artist lectures and performances, and enjoy an enriched music curriculum because of this partnership. During the summer months, Greenwood's campus belongs to the Yellow Barn Festival. Their artist in residence musicians live on campus in the dorms, and practice in nine cabin-like buildings that serve as Greenwood classrooms during the school year. 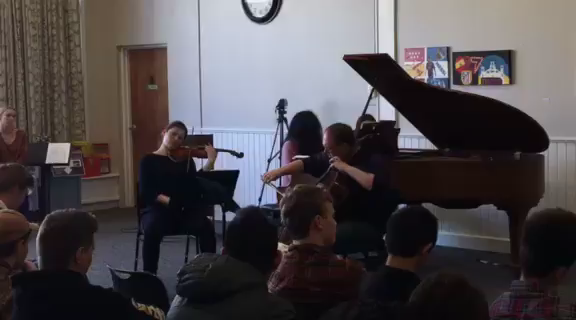 Greenwood turned the library into a makeshift concert hall, where students and faculty were treated to a stellar after lunch performance. Thank you Yellow Barn for bringing so much talent to our school! Our friends from Yellow Barn arranged a private performance and demonstration with Grammy winning, Third Coast Percussion artists.